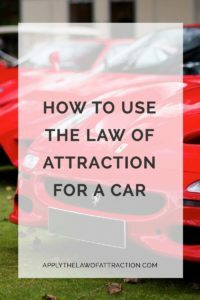 If you want to use the Law of Attraction for a car, there are a few very simple steps to follow. The key to your success isn't in how much money you have, your credit, or even how hard you work at using the Law of Attraction for a car. The key to your success lies in whether you believe you can manifest a car. If you believe, then the steps I'm about to tell you will produce fast results. What car do you want the Law of Attraction to bring you? The first thing you need to do is figure out what car you want. Be as specific as possible. What condition (i.e., new or like new)? How does it handle (i.e., smooth, rough)? Do you enjoy driving it? Does it have anti-lock brakes? How do you know it's your car? Is it easy to pay for? Is it easy to insure? There are a lot more things you can include. Do your research on cars. Find out every possible thing your car can come with and decide which features you want. Many times people use visualization by seeing themselves up on a movie screen being the person they want to be and having the things they want to have. This isn't the way you want to visualize. You'll end up spending a lot more energy and time than you need to. The results will take longer and it will feel like you're doing this all on your own instead of harnessing the power of the Universe. Instead, you need to visualize from the end point, meaning you need to visualize as if you – not a movie screen version of you – but you yourself already have your car. You need to imagine that you're opening the car door, feeling the metal of the door handle under your hand, hearing the release of the latch as the door opens. You need to feel the car seat under you as you sit back and inhale the smell of your car. You need to feel the steering wheel under your hands as you hear your car engine come to life. The visualization should be so real that when you open your eyes, you're almost surprised to be back in reality. When you're done, go about your day expecting the Law of Attraction to bring you your car. Throughout the coming days, you'll start to notice things happening. You might see the car you want everywhere. You might hear people talking about it. You might get inspired to go for a test drive. These are all signs that the Law of Attraction is working. When you get inspirations or urges to do something, act on them. Maybe it is to go for a test drive or to read the car section of a newspaper. These things aren't something to be ignored. They're like breadcrumbs leading you to your car. They're there for you to act upon them. Each time you take inspired action, you're one step closer to manifesting your car. You can use heart energy to amplify your vibrational energy, so that the Law of Attraction attracts a car to you quickly. It's a simple process that really works. Simply imagine yourself surrounded by love and send heart energy out to the car you want. Know that your heart energy is reaching the car, surrounding it, and drawing it to you. The car is already yours. It was yours the first moment you thought about it. Simply allow the Law of Attraction to bring the car to you. Great ideas! No one else seems to tell how to do this for cars and stuff. This is exactly what I have been looking for. Thanks Joshua! I’m glad you enjoyed it and found what you need.